Advanced Animal Care of Colorado is proud to offer ultrasound examinations as part our diagnostic capabilities. Most people are familiar with ultrasound due to its frequent use in pre-natal exams in humans, but this non-invasive technology has a wide range of applications. It works by sending a silent, harmless pulse of high-frequency sound waves through the body. Different tissues alter the path of this sound wave in different ways, and these differences are analyzed by a computer and used to produce the image. 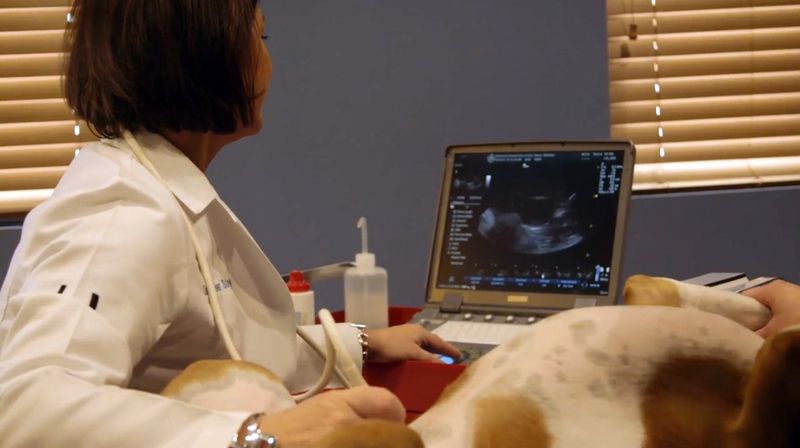 An ultrasound exam is an excellent diagnostic tool for evaluating your pet because it provides a real-time view of your pet's organs, thus providing information that is not obtainable in any other fashion. Dynamic processes such as blood flow, gastrointestinal contractions, and heartbeats can be evaluated as they occur. Ultrasound also permits your veterinarian to see the internal structure of an organ in a non-invasive fashion. While ultrasound is most commonly used to evaluate the abdomen and the heart (an ultrasound exam of the heart is frequently termed an "echocardiogram"), it can be used to evaluate the eye, lymph nodes, the thyroid gland, the larynx, and virtually any part of the body that sound waves can reach. Often, but not always, used in conjunction with other diagnostic modalities such as radiographs and blood tests, an ultrasound exam is an invaluable tool in the medical evaluation of your pet. At Advanced Animal Care of Colorado, our doctors have extensive training in the use of the ultrasound as well as the availability of a board certified veterinary radiologist to review our ultrasound exams. Our equipment is state of the art and connected to our Telemedicine service to be able to transmit our images instantly to a Radiologist as well as share our images and videos with you, the client.